Update: After you finish reading this review, check this updated review, posted six years later - describing how my Fit-Ear plugs lasted, and what I think of them now. I have fairly severe tinnitus, from years working as a club DJ in my late teens/early 20's. I am now very sensitive to loud noise, and while my GL1500 is very quiet, the sound of wind at any kind of speed as it flows over my helmet is very loud - and it is extremely uncomfortable. Wind noise inside a motorcycle helmet when riding behind a windscreen is about 85 dB(A) at 35 mph, increasing linearly when plotted against the log of speed, reaching over 105 dB(A) at 100 mph. At 100 dB(A), you will produce permanent hearing damage after two hours. Therefore, I have always worn ear protection on my bike. In some countries, states, and jurisdictions, it is illegal to wear ear plugs on a motorcycle, just like it is illegal to have headphones or speakers inside your helmet. I have not heard of these laws ever actually being applied. I don't care - I am more concerned about my hearing than I am about a ticket. I would buy these in a bulk box from Amazon of 200, for around $30. I still do, for use around the house, mowing the lawn, and so on. These work very well, and can be reused a few times. However, after a few hours they exert pressure inside the ear canal that causes ear pain. These are much softer than the E-A-R product, and seal might tighter than the E-A-R product - and are probably a bit more quiet. However, they exert more pressure than the E-A-R product and cause me pain after only half an hour or so. I also found that they also seal so well that if you are not careful when removing them, doing so very slowly, the sudden change in pressure behind them can cause sudden severe pain in the ear drum. At the Cleveland Motorcycle Show a couple years ago, I saw a product from Fit-Ear - they custom molded ear plugs to your ear canal. Instead of having foam constantly exert pressure inside your ears, these ear plugs fit exactly to your ears. They push some cotton into your ear to prevent intrusion of the material too far, followed by a small thread. They then inject the silicone-like material into your ear. You wait for five minutes or so for it to harden. I have been using these ear plugs on every motorcycle ride for two years now, and I absolutely love them. 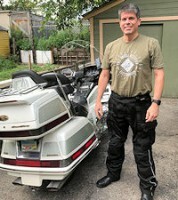 They work better than anything else I've ever used, are supremely comfortable, and never get sore - I wore mine on a 19-hour ride to Florida - and then back again two days later. They should last for many years, and if mine ever do wear out, I'll definitely be getting another pair. They also have higher-priced products with tiny speakers built into them, to plug into your Goldwing's audio system. No provision is made however for the microphone. 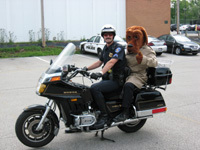 If you don't use your CB and don't travel with a passenger however, this might be a viable option for you. The company travels around the country to various shows, and they have a calendar on their web site showing when they will be in your area. If you have the opportunity, I highly recommend their product. I've had these for about 10 years- very popular in shot gun sports such as sporting clays etc. a required item as is saftey glasses while shooting, but my hearing went south while in Marine Corp working on helicopters. Now I just got a set of hearing aids which help in the higher freq range. 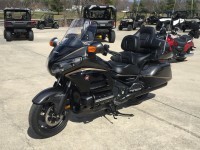 Should help when riding in our GWRRA group to hear the CB talk..
safe riding and appreciate your topics on this web site- keep up the good work. WingAdmin, do the custom molded earplugs allow any sound in, or is it completely quiet? I'm curious if you can still hear the speakers in your helmet for audio and intercom. I know you mentioned they also make another product with speakers built into them with no mic. That seems like a whole lot of stuff in a very small place. I also have a pair like this. The company came to my work and made a pair for everyone. And then they trained the nurse to do them. I lost my first pair but they have you in a data base and can make another pair .They are about eighty dollars at the time. But you are correct in that they don't put pressure on yourears after long term use. I am a aircraft mechanic and its very noisy most of the time. nsjoe wrote: WingAdmin, do the custom molded earplugs allow any sound in, or is it completely quiet? I'm curious if you can still hear the speakers in your helmet for audio and intercom. I can still hear the speakers in my helmet, but I do have to have them turned up a fair bit to get through the earplugs. They don't block all noise - you can still hear traffic, engine noise, etc. - just much, much quieter. The tiny speakers are actually designed to fit inside these types of earplugs. You'll see a lot of stage performers wearing them. They are definitely not cheap! I got a custom set made at a Wing Ding several years ago and they worked very well - until I lost them. I discovered, however, that you can buy a 'kit' on-line and make your own. The set I bought was the 'Radians' brand. If you do a Google search for: 'radians custom earplugs', it will turn up multiple sources including Amazon. Think I paid less that $15 including shipping. Very easy to make and mine work as well as the custom set I lost. For the price, you can afford to have a spare set! I have those same custom made ear plugs, they are awesome! I no longer suffer from fatigue on those 12 hour riding days like I used to before. It is amazing how much the constant drone of the wind (a BIG problem here in the wide open prairies) can tire you out. 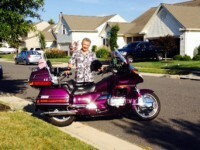 And yes, this drone does damage your hearing, even on a Goldwing. I can easily still hear the headphones in my helmet (volume need to be at 20-24) and the CB radio....it just knocks down the irritating wind noise. I got mine at Costco at their hearing centre, $69 and took about a week to come back. They come in a nice small carrying/storage pouch that I leave with my helmet so I don't forget them. I removed the dongle between them as it was always getting caught by the Velcro in my jacket's collar. Get some, you will be more relaxed when you arrive at your destination and you will protect your hearing for when you get older (or more older than you are now, etc. !!! ).